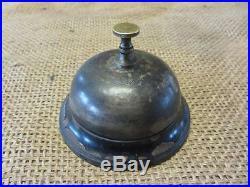 Vintage 1887 Spinner Cast Iron & Brass Desk Bell > Antique Hotel Bells 9518. Vintage brass and iron hotel desk bell. The bell is brass and the base is cast iron. To operate this bell you spin the knob. It has a ring that goes on forever!! The bell has a 3 1/2" diameter and is 2 3/4" tall. 9413 Pat'd June 21 1887. Good condition without and cracks, breaks or repairs. The brass has a nice patina tone. See description above for further info on the condition. Create listings that get noticed! With Auctiva's 1,800+ Templates. The item "Vintage 1887 Spinner Cast Iron & Brass Desk Bell Antique Hotel Bells 9518" is in sale since Monday, July 25, 2016. This item is in the category "Collectibles\Decorative Collectibles\Bells\Mixed Materials". The seller is "*miliki*" and is located in Red Oak, Iowa. This item can be shipped worldwide.